I do like the hotel Alter Posthof and their breakfasts are very good. I was first down to breakfast and then Simon and Joyce arrived. We had some cereal (and discovered the milk was a bit off when it curdled in our tea) and then Klaus arrived. He requested scrambled eggs and Simon and I said we’d also like them. When the eggs came it was one large plateful. 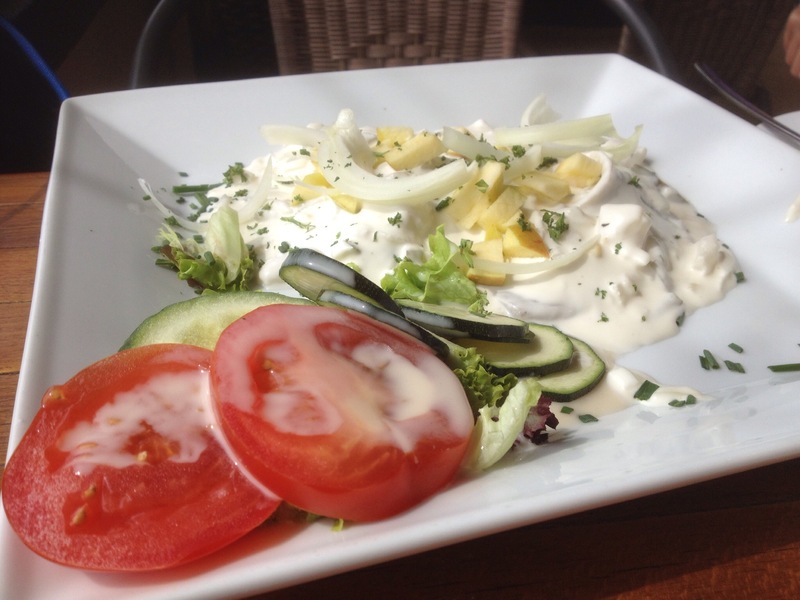 Klaus dished himself out a portion and Simon then proceeded to scrape the rest of the egg onto his plate. He had forgotten I was having some. We ribbed him about this for the rest of the day. 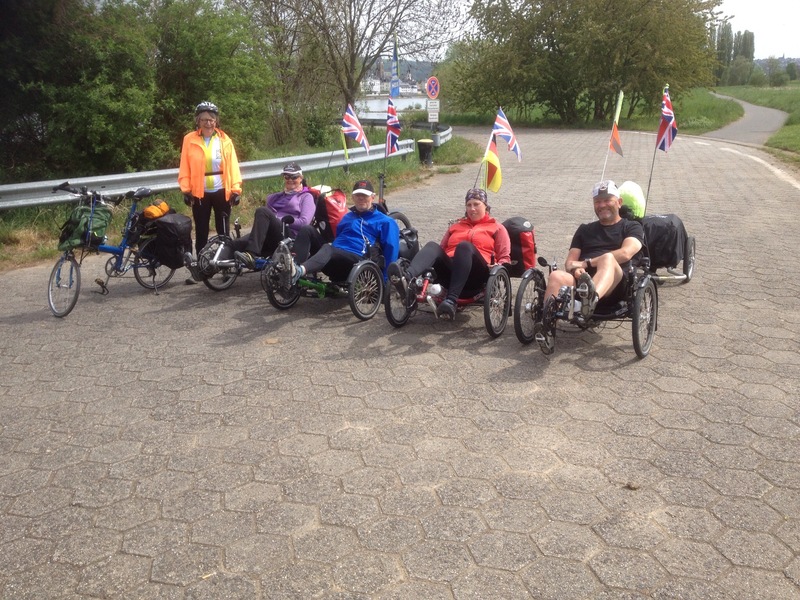 After a bit of bike fettling (pumping of tyres etc) we set off heading to Bad Honnef. 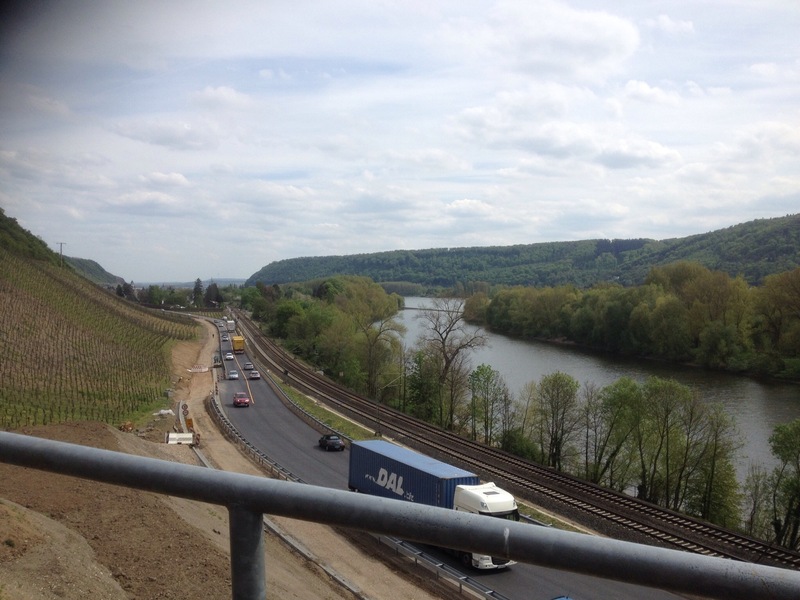 Today we would be riding on the right hand side of the Rhein after Koblenz – I had never ridden this section before (I had always taken the left bank) so was looking forward to it. 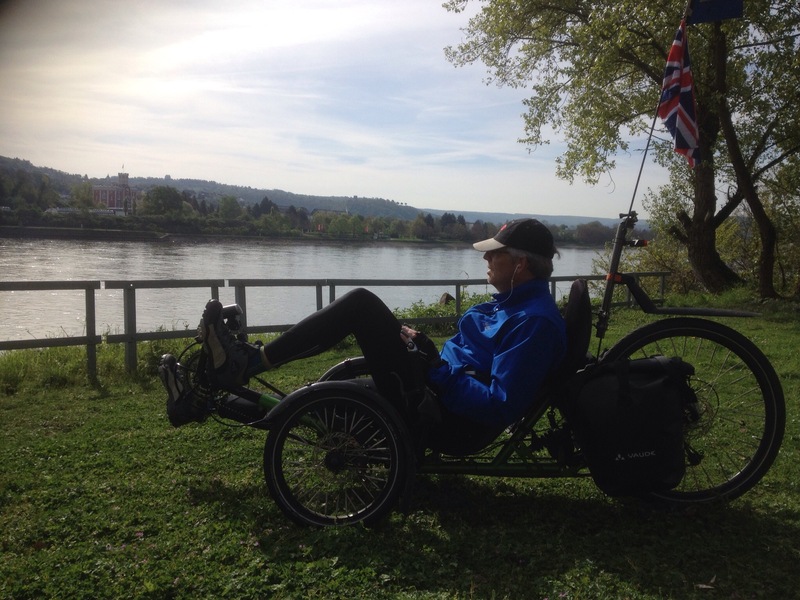 As we trundled along the Rhein Path through Spay with the heavy legs of early morning Simon nipped off the trike to do some elliptical training. We had various stops to don gloves, buffs etc as it was surprisingly cold, but as usual the view of the river was great. Klaus seems to like listening to music for the first couple of hours so we have got used to him cycling along with earphones in, nodding his head in time to some eighties hit. 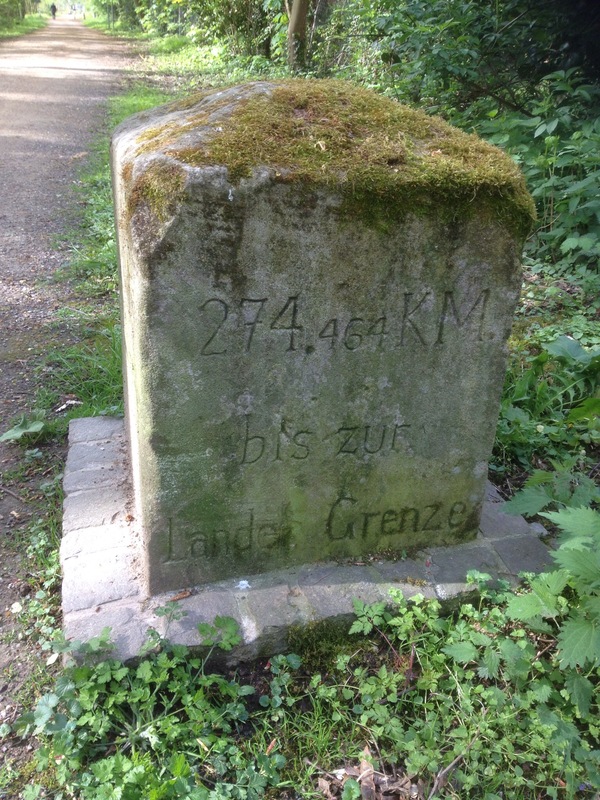 As we were cycling along towards Koblenz I saw this rather interesting milestone. 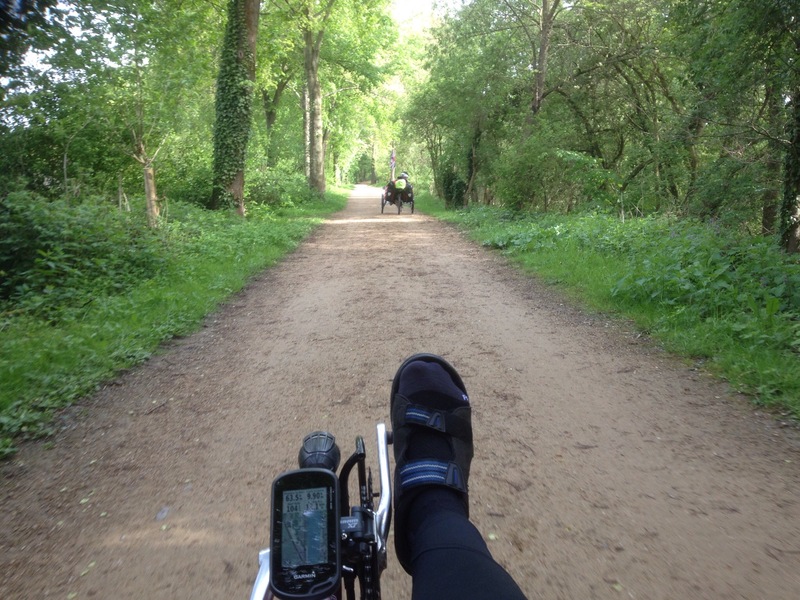 The day was surprisingly chilly – we had got used to temperatures of 18-20 and today was 14 – so in the end I had to stop to puut on some socks. Yes, I was wearing socks with sandals (but in Germany this is allowed, although I should really have chosen white socks with my sandals for the full effect). 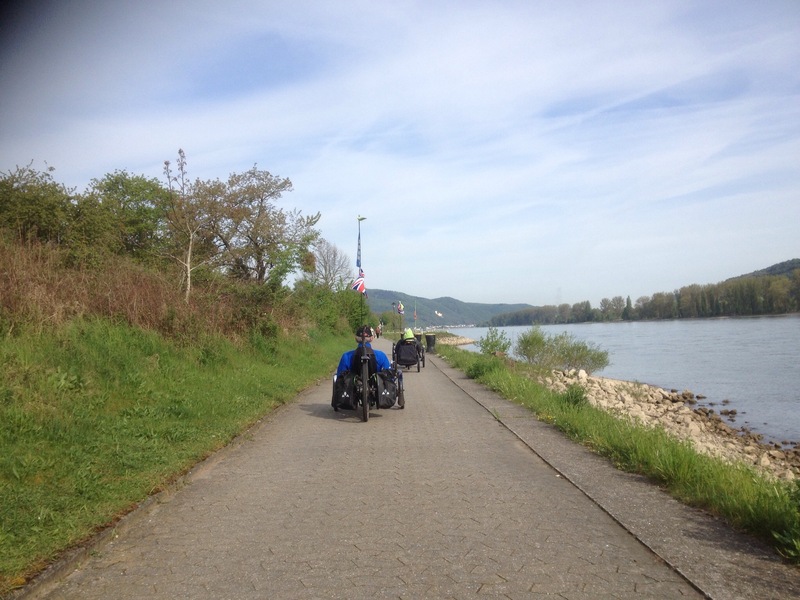 Soon we arrived at Koblenz and stopped, as before, on the large open space before the statue of Kaiser Wilhelm I.
I had never actually walked up to the statue so decided today was the day – Simon and Joyce decided to come with me and Klaus would look after the trikes. 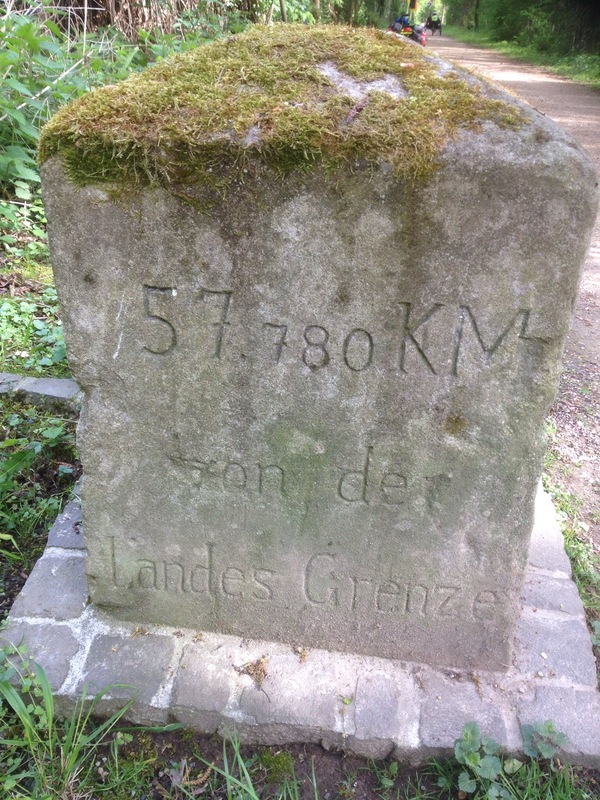 We walked up the first set of steps and I found this plaque of my adopted county. We looked down on the tiny people and tiny trikes from our lofty position just below the statue. 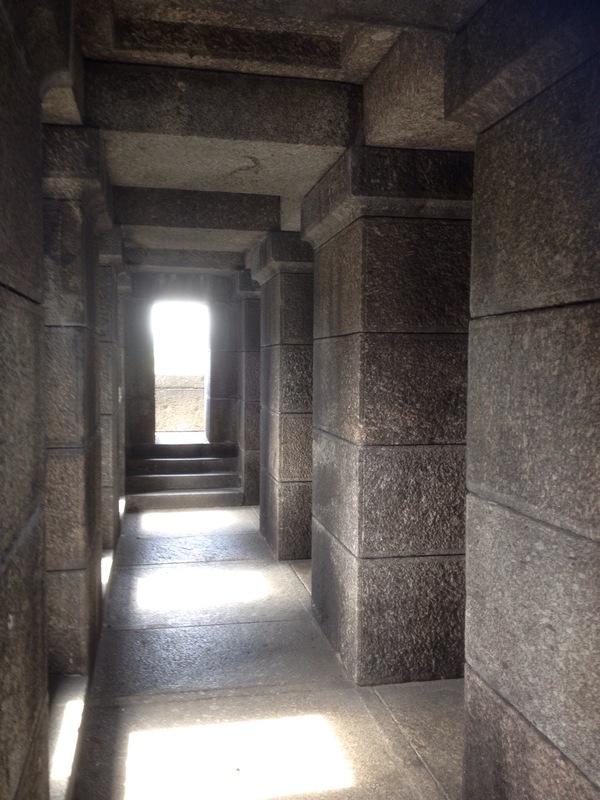 It’s very interesting inside the statue plinth. 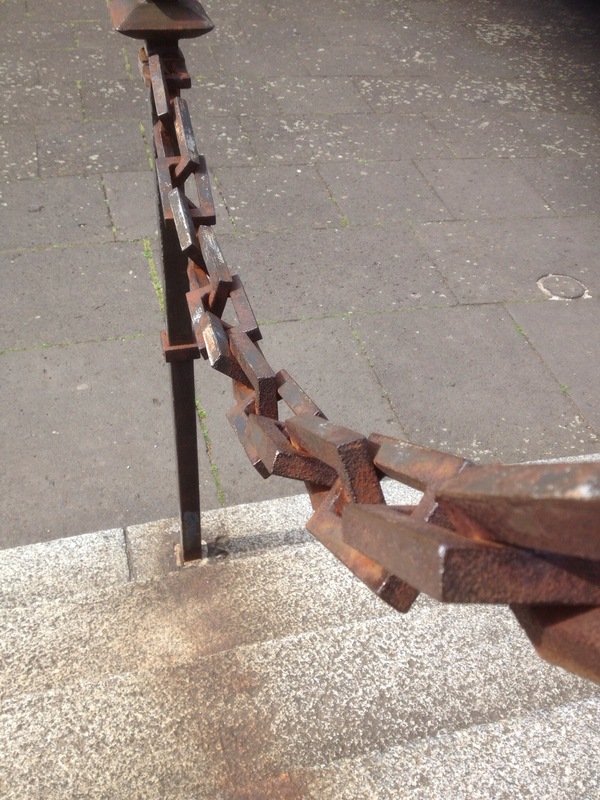 On the way down I was rather taken by this rectangular chain. 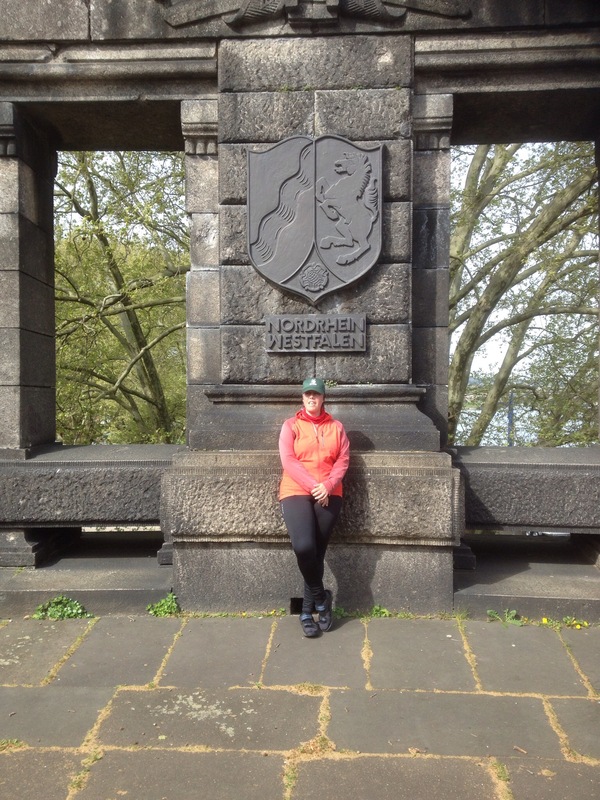 Although we’d spent a good fifteen minutes faffing at Deutsches Eck we all fancied stopping for a coffee and cake so found somewhere just around the corner. 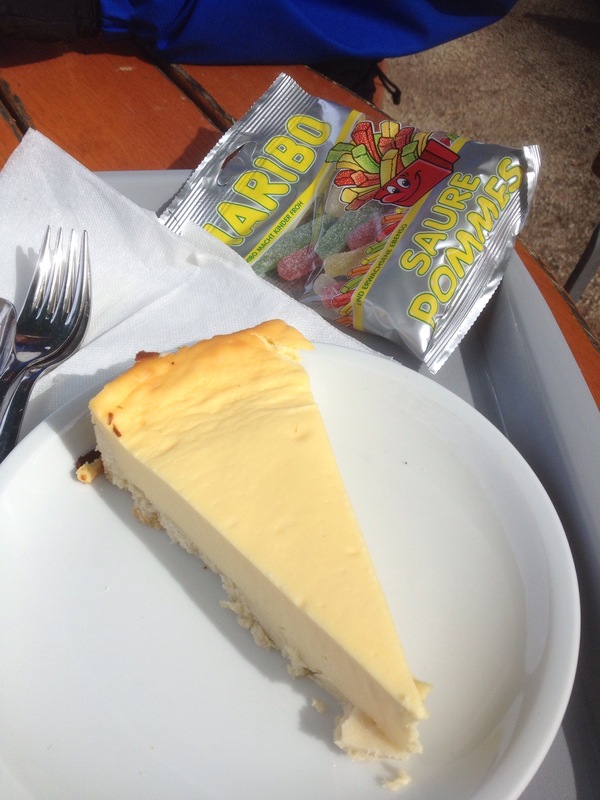 Klaus was delighted to find some Saure Pommes Haribo (his favourite) so bought them with a cheesecake too. 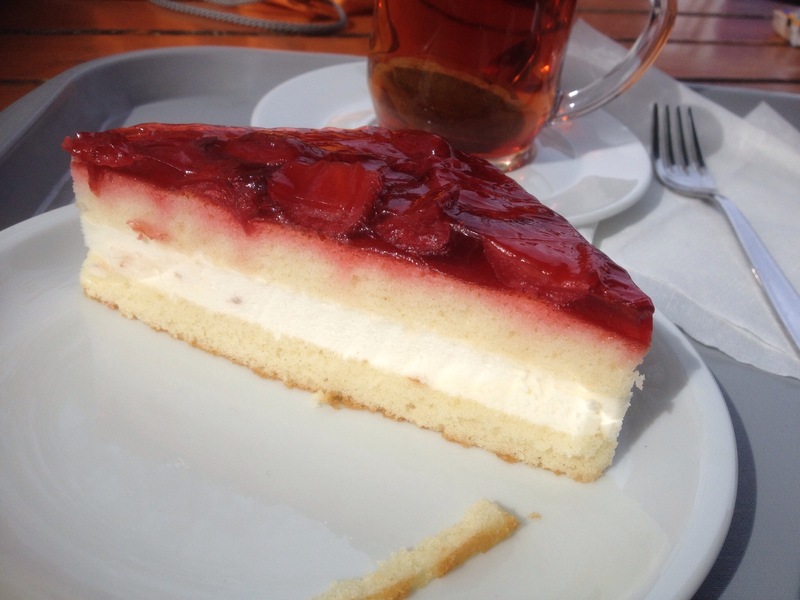 I had a strawberry cake. 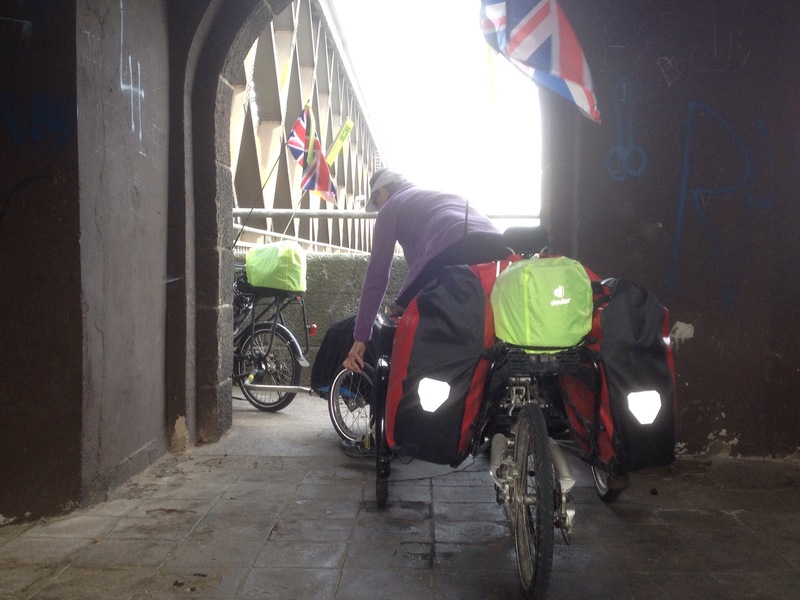 Yesterday we had met a lone woman cycling on a Bike Friday folding bike. 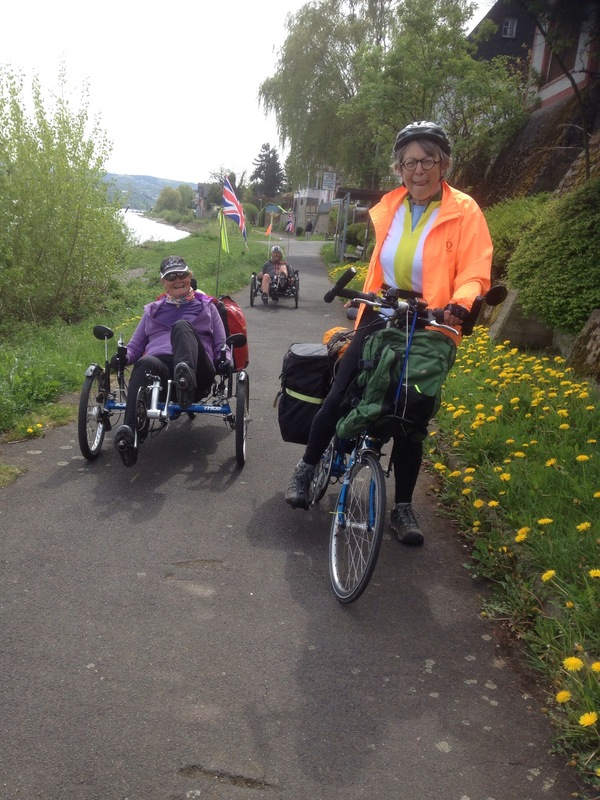 We spotted her again as we were heading out of Koblenz and she asked to join us as she was not too sure of the route (and I am very familiar with it). 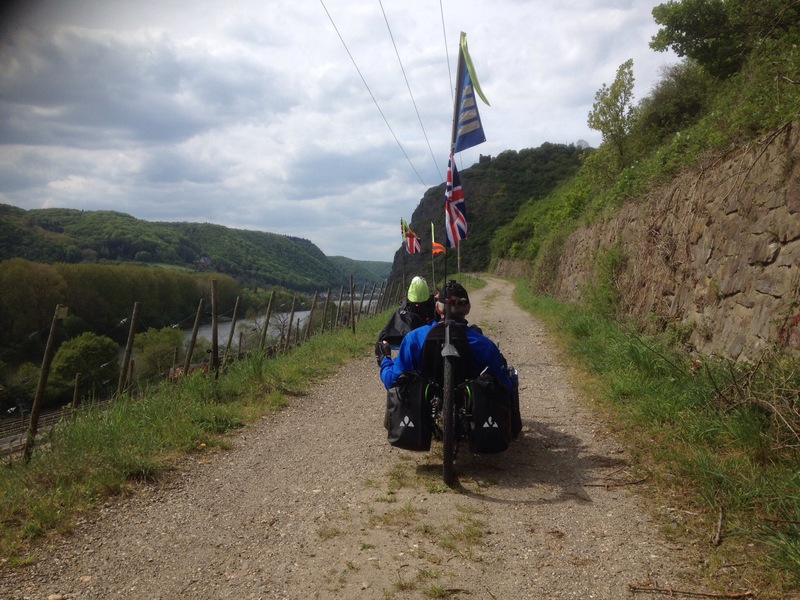 She rode with us north out of Koblenz until we reached the bridge where we were crossing to the right hand side of the Rhein, at which point we said our goodbyes. 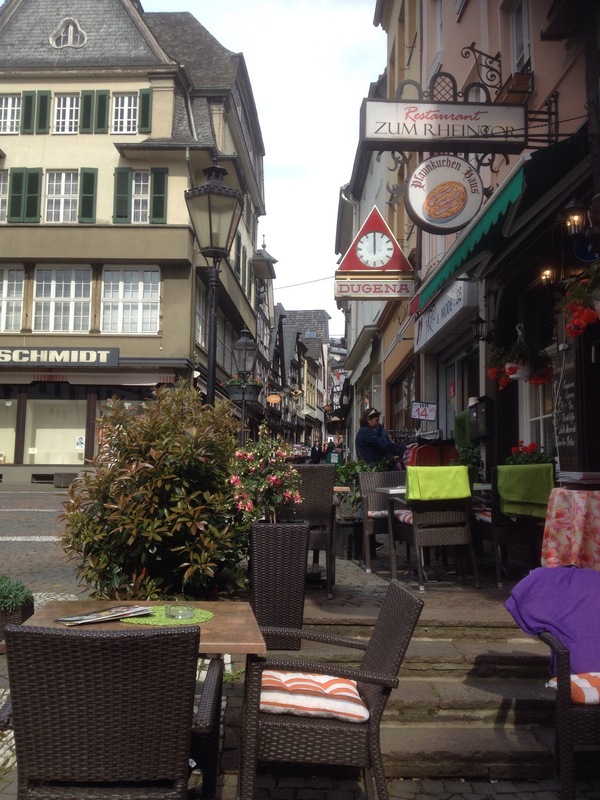 These photos were taken by a passer-by who appeared on a Hase Kettwiesel. 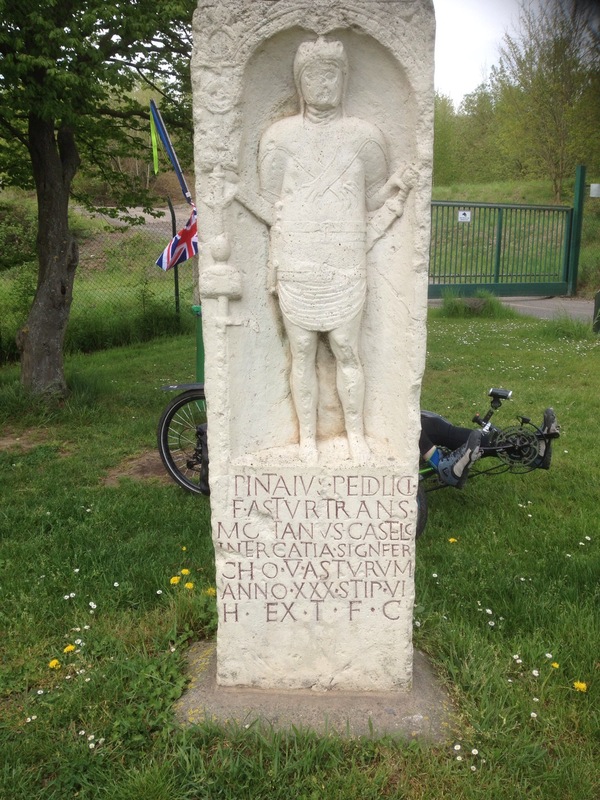 He had bought it via eBay and travelled from Aschaffenburg to Köln by train to collect it and was riding it back as far as he could in the time available (and then taking the train). 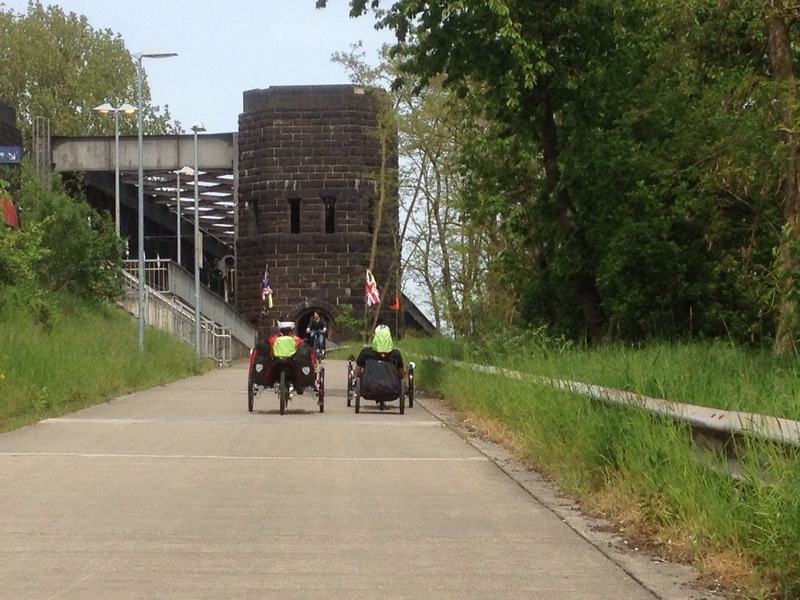 Here are Simon and Joyce about to cross the bridge. 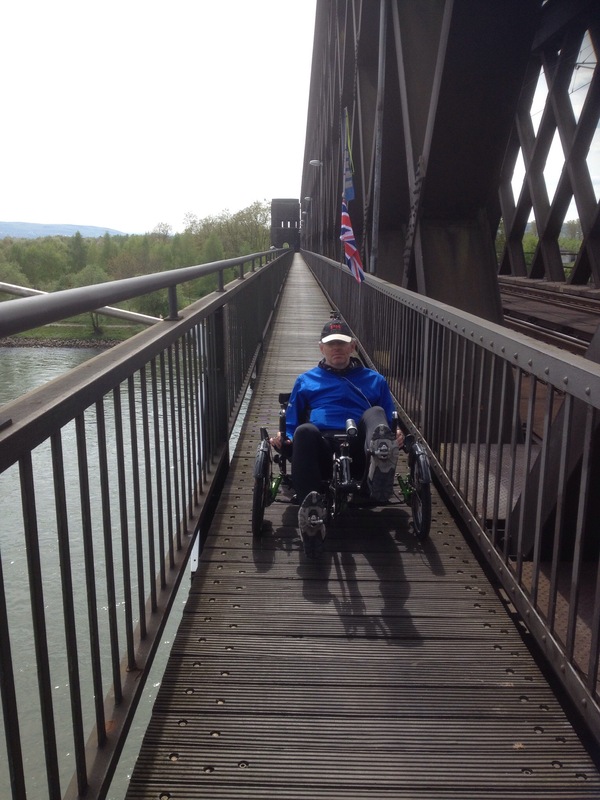 There are some very sharp turns through the towers of the bridge and Simon’s trailer couldn’t get round without some help from Joyce. It’s an impressive long bridge. 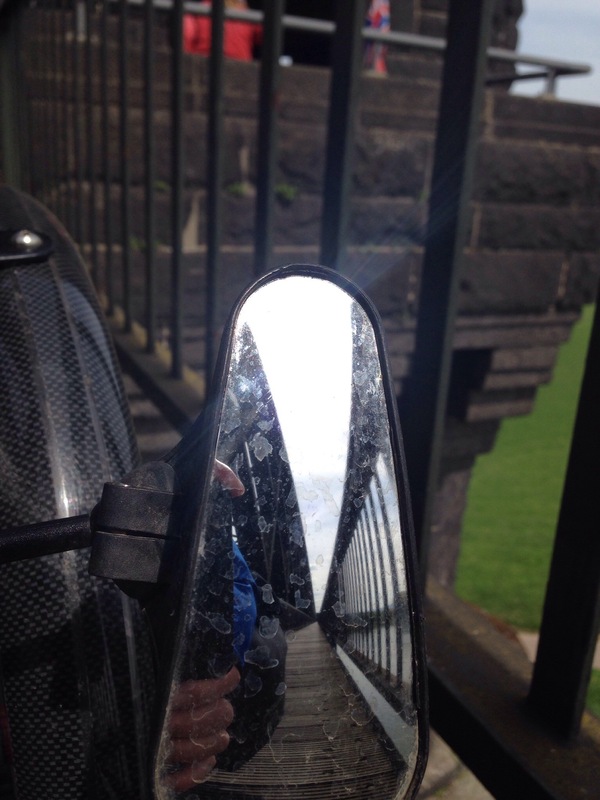 Klaus took this photo of the view in his mirror. 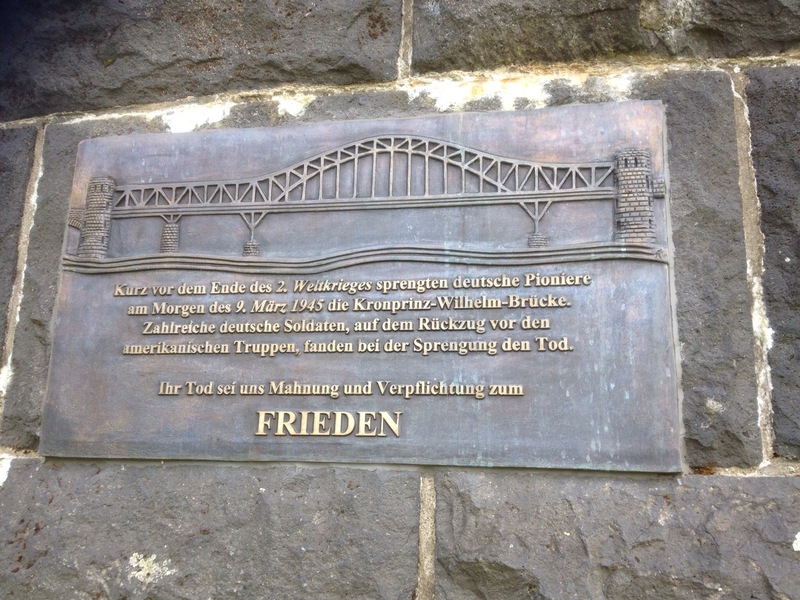 Once we had finally crossed (which took a while with the wide trikes) we saw this plaque about the bridge. 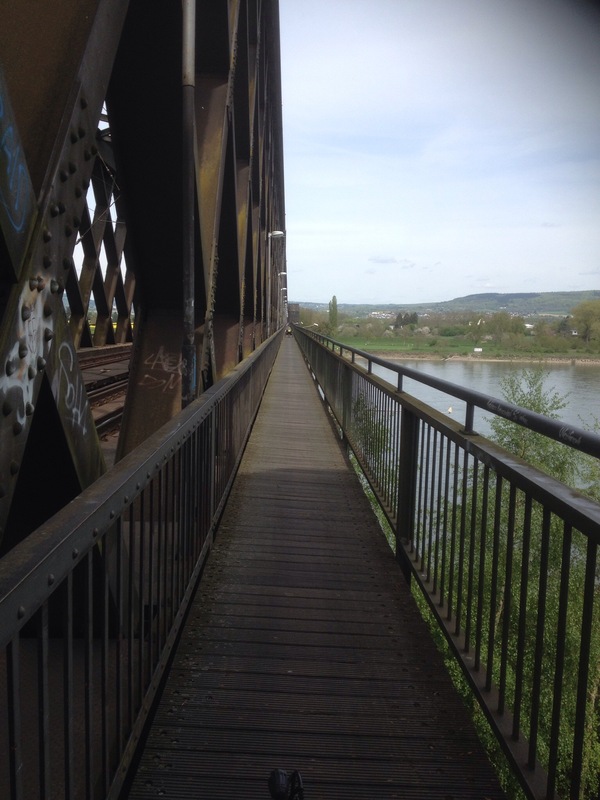 And here it is again – an impressive bridge and fun to cross as long as you don’t mind heights. 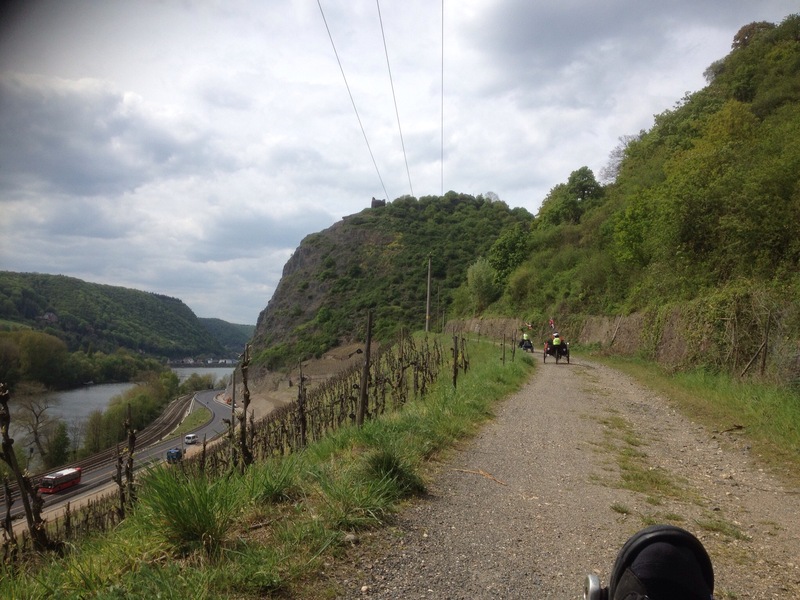 We were now on a brand new section of Radweg to me so it was a bit of an unknown. We were also getting a bit peckish and decided to stop somewhere for food although it took a little while to find anything suitable. Finally we located a reasonable-looking restaurant directly opposite the Andernach Geysir. We had hopes the Geysir would go off whilst we were there (it goes off for 5 minutes every 100 minutes and is 60 metres high) but we were out of luck. This turned out to be a rather strange restaurant. The guy serving us looked like he had just been woken up as he was constantly rubbing his eyes. He was fairly old and doddery and seemed to find it hard to deal with our orders. When the food came it was very nice though. 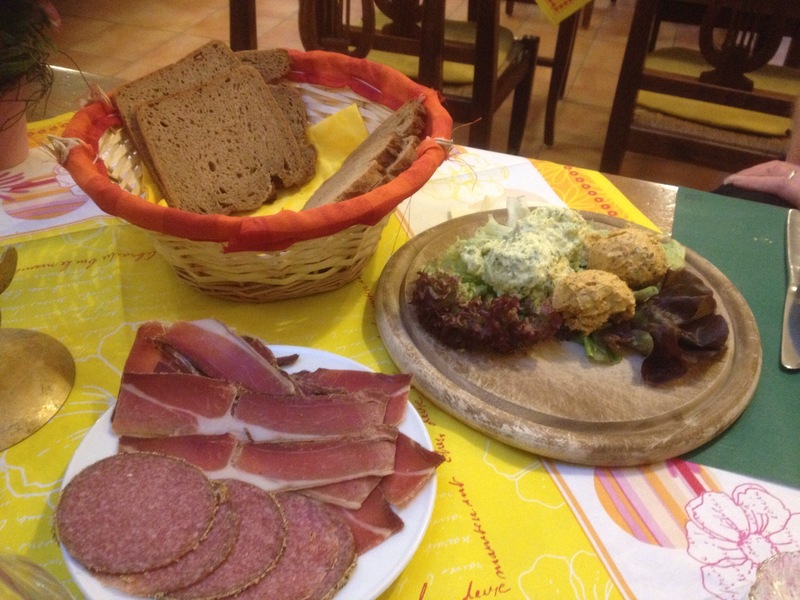 However when the time came to pay the bill (which took ages – and we never had a chance for a refill of drinks) he overcharged me by 10€ (which I noticed straight away) but also overcharged Klaus by 2€ (which he did not notice straight away). Although the food had been good the service was pretty poor – we didn’t tip. 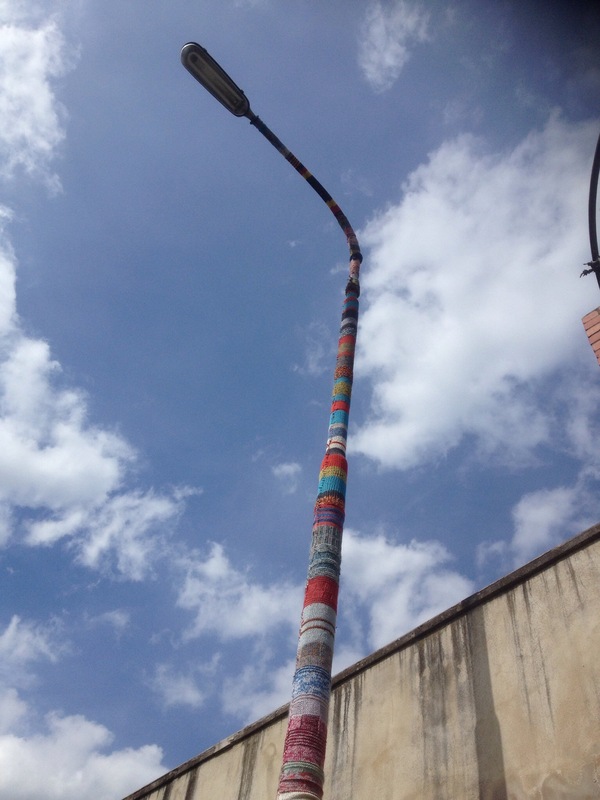 We continued on and saw more evidence of yarn bombing. 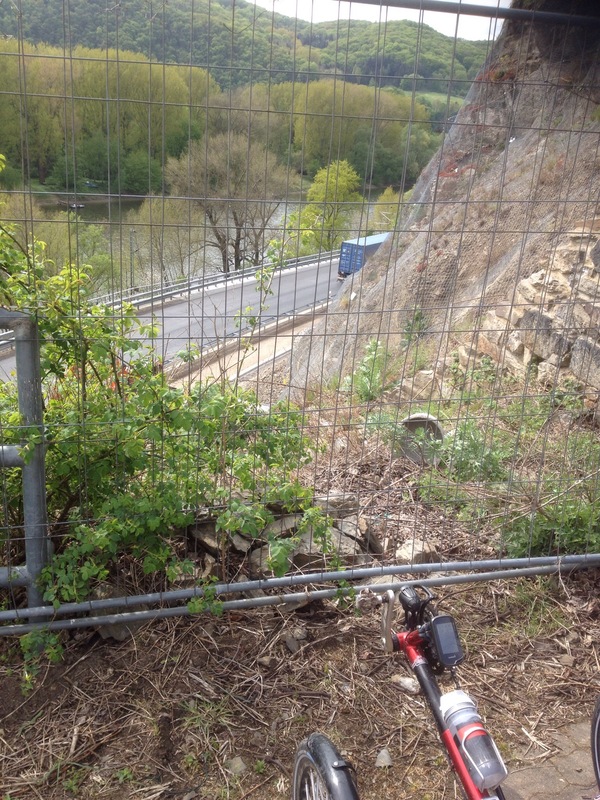 In Leutesdorf my route, which goes along the side of the Rhine, did not agree with the signposts. We initially followed my route but a chap outside his house said that way was blocked and we had to take the other route. 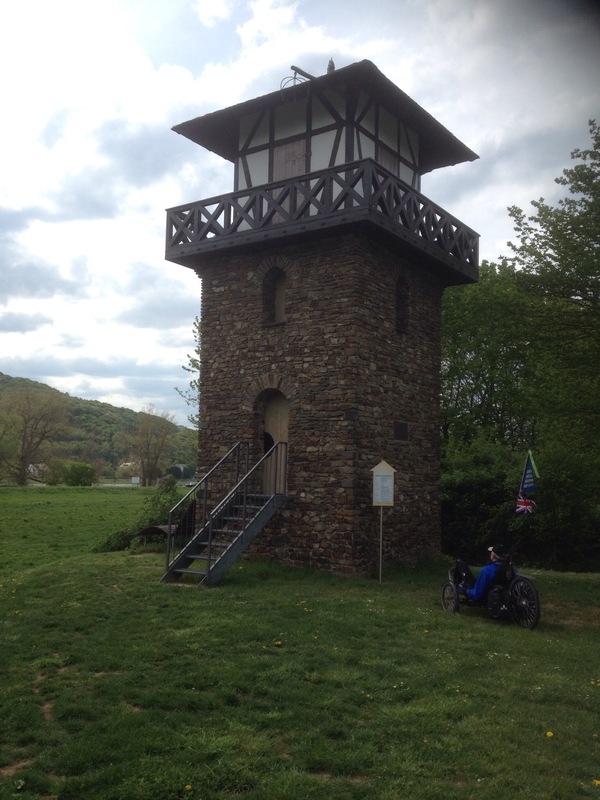 So we did – and it turned into a bit of a climb! 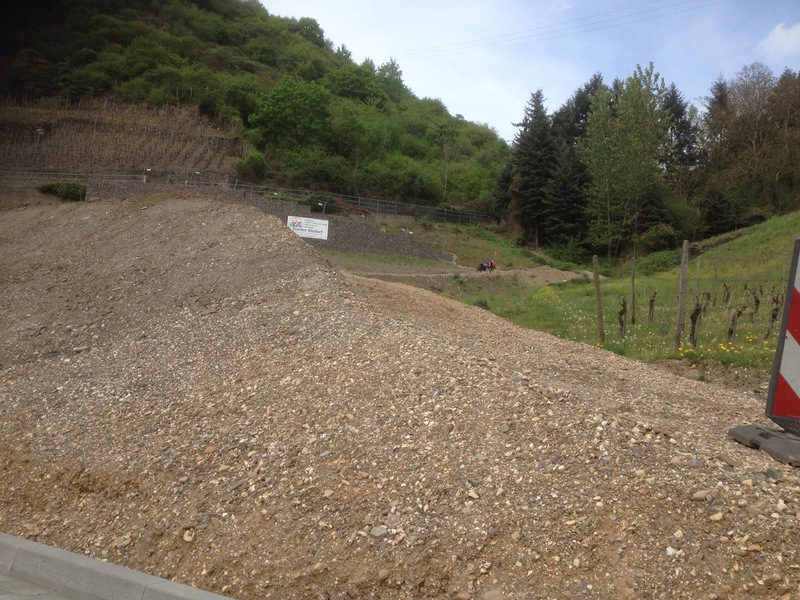 But then we came to a section which was not at all to our taste – there was a really steep ramp which led straight down to the major road which was being worked on. No sign of a usable cycle path. Uh oh! We would have to ride along this road. It was clear there was only one way we could go – down this rough track. Klaus decided to go first because he is brave. 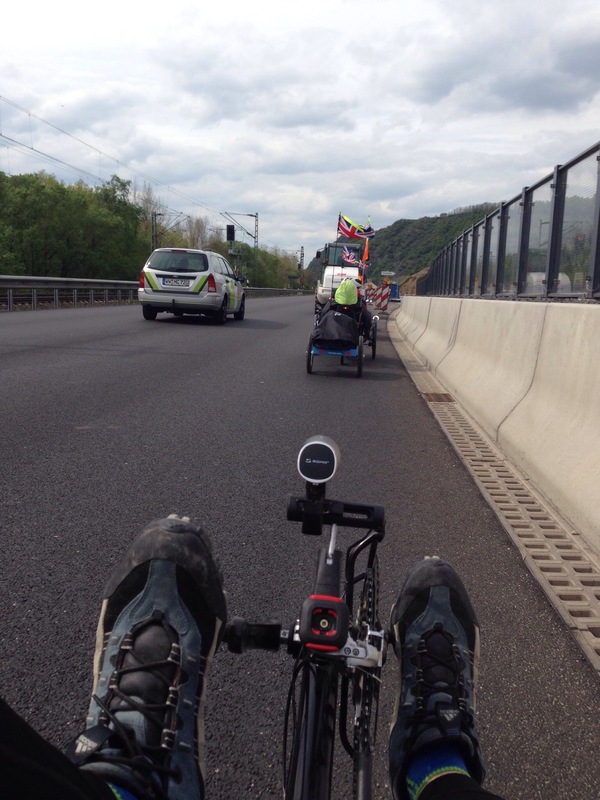 I went down next – it was quite exciting as all three wheels tended to drift a bit and I was using my brakes a lot. Joyce waited till I got to the bottom and then set off. 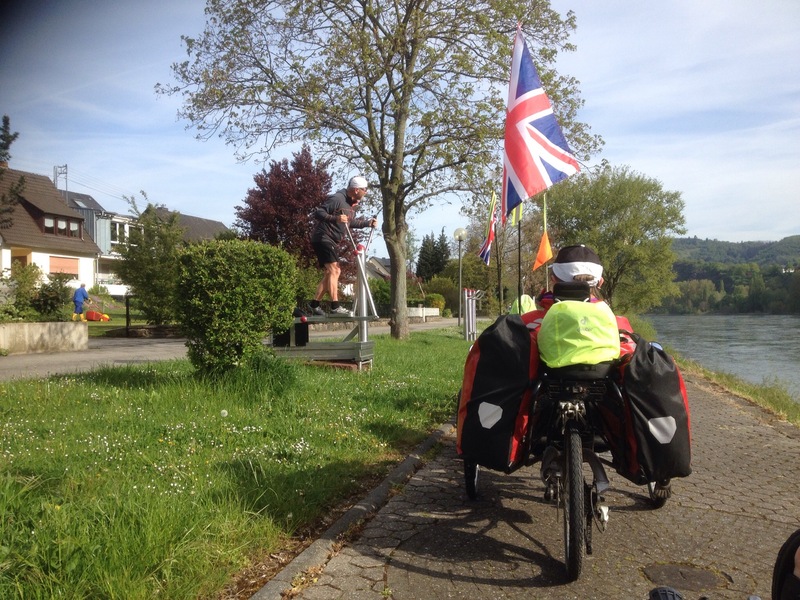 This isn’t her favourite kind of riding by any means and she only has drum brakes, not discs, which can be slightly less confidence-inspiring but she made it to the bottom OK.
Simon came down last – he said with the trailer behind it was ‘interesting’. 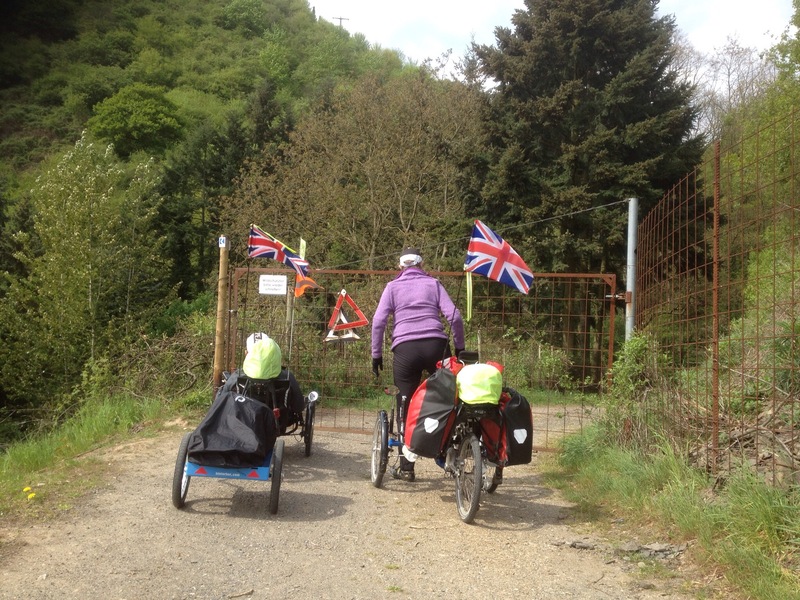 The cycle route diversion signs suggested we ride along the right hand side – but there was a lorry parked in the way. 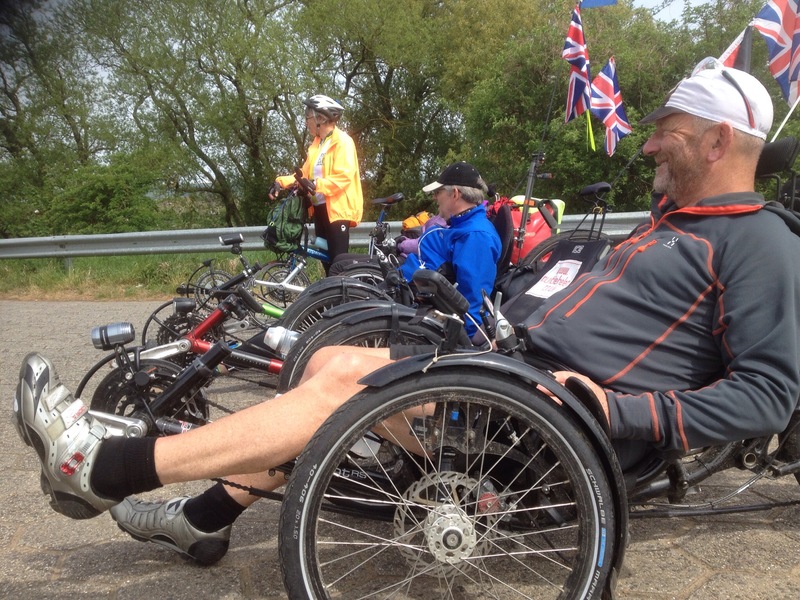 Klaus chatted to the lorry driver who said there would definitely be no way through for us – we’d have to ride on the main road, the B42. So we went back a little way to where there was a break in the armco and headed off, riding on a road that was undoubtedly not allowed for bikes. One of the workmen with a digger drove behind us for a bit, then overtook. We had thought he was shielding us but I am not so sure. This was not idea riding conditions really but we survived it unscathed and were back on a decent cycle path reasonably quickly. 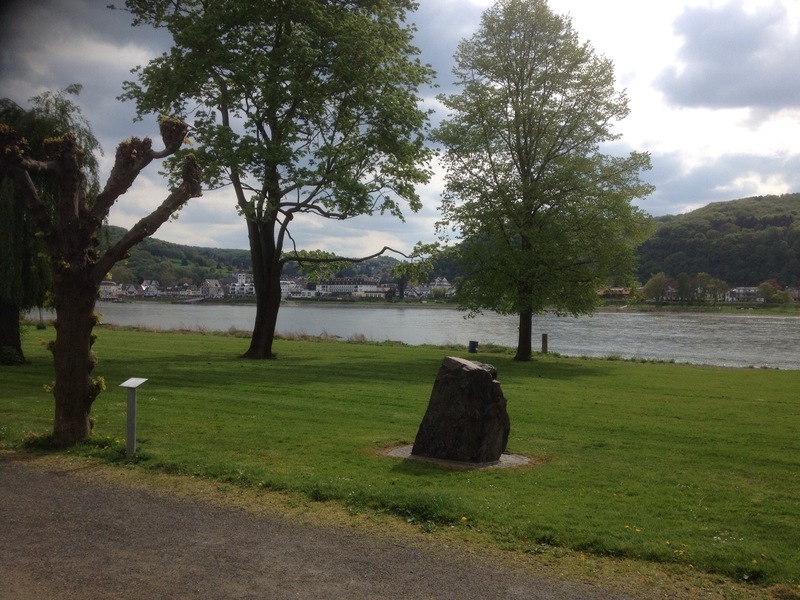 Being on the other side of the river is interesting – here we are looking across at Bad Breisig. 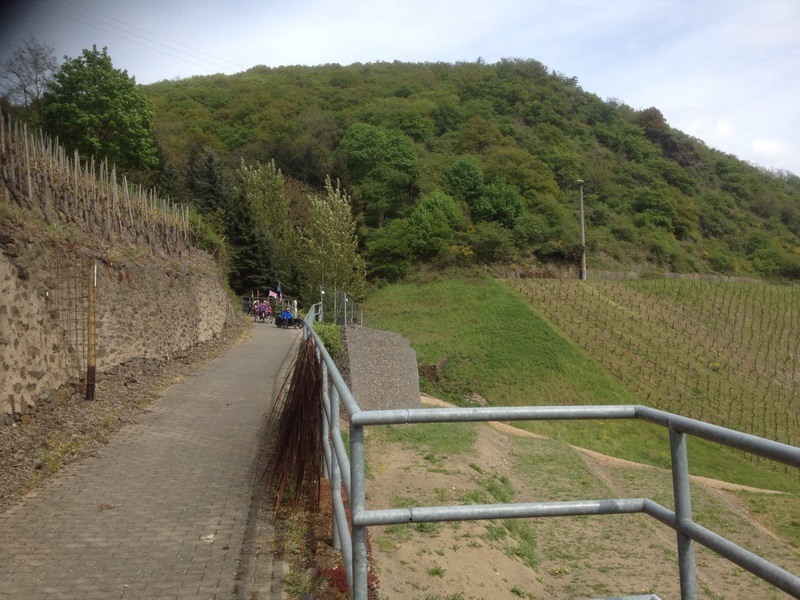 This side of the Rhein feels like it is a bit hillier than the other – there are occasional very sharp, steep climbs in some of the villages. 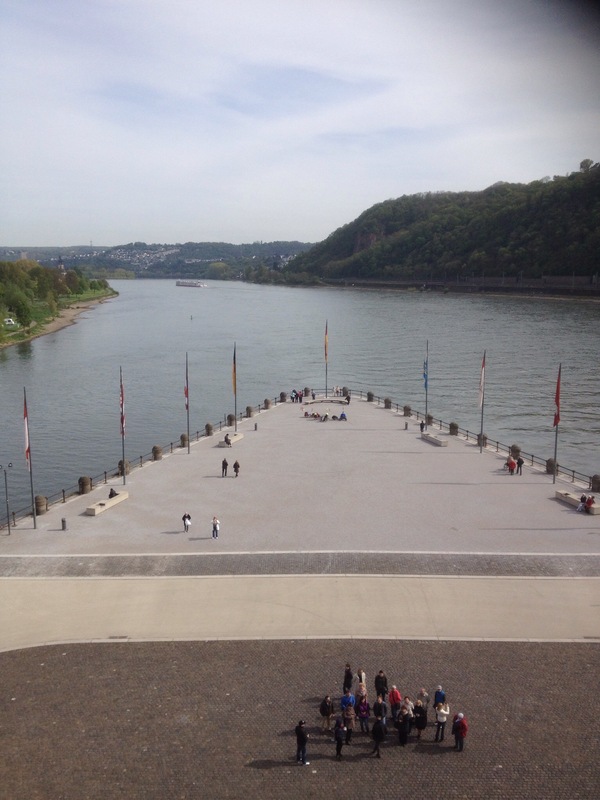 As we arrived in Linz we felt it would be nice to stop briefly for a cake or ice cream. Linz was a very attractive place but as we entered the pedestrian area a woman moaned about us cycling (at walking pace). 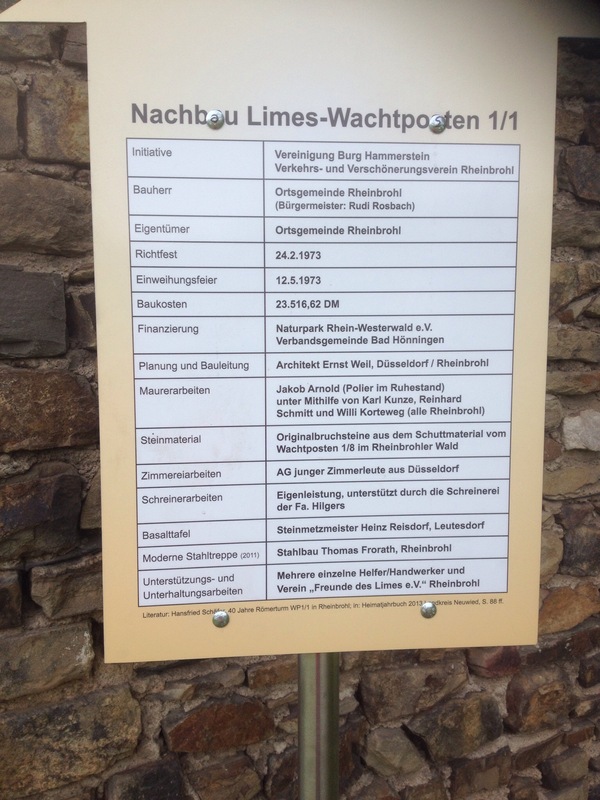 An example of an officious German – you do come across them occasionally. We stopped at a place which advertised waffles – but they had run out. 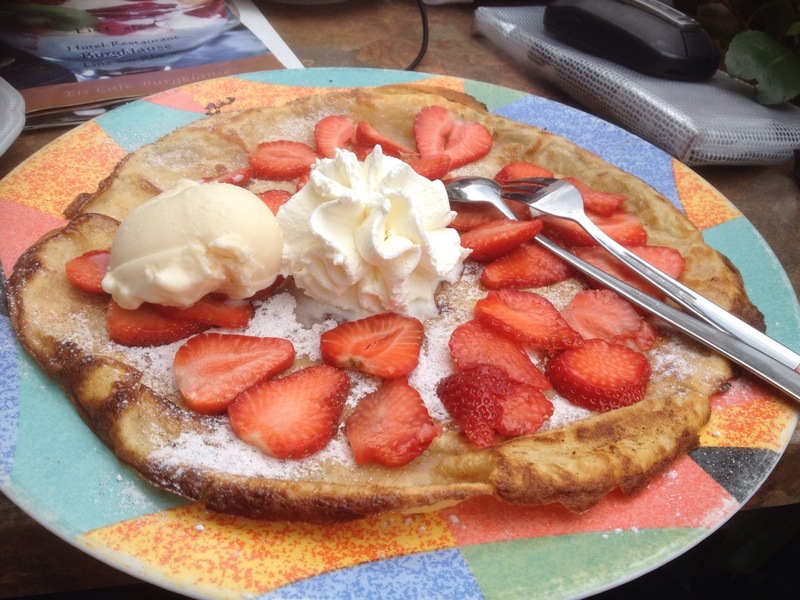 However the chap offered pancake with strawberries, ice cream and cream. 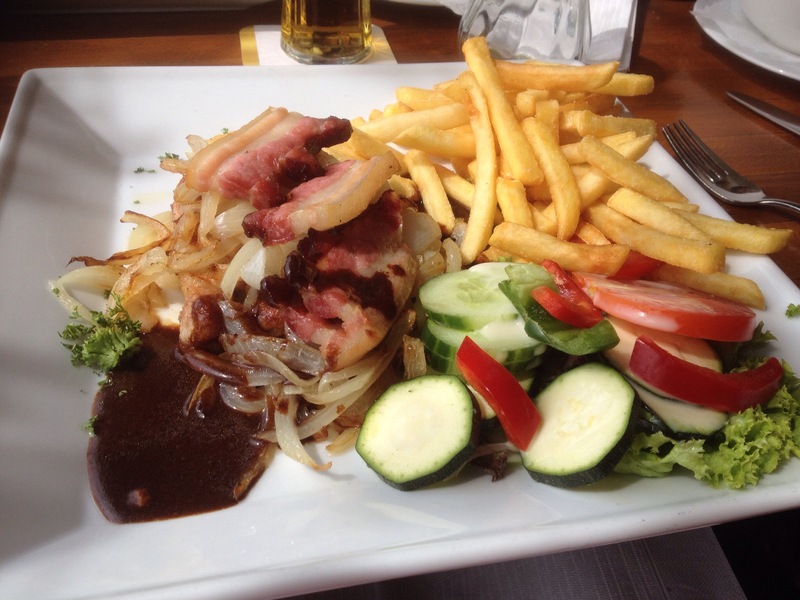 Joyce, Simon and I all said yes to this but were a bit shocked when the bill came – 9,50€ each!!!! We headed off feeling a bit stung by the expensive pancake (which was nice, fortunately). 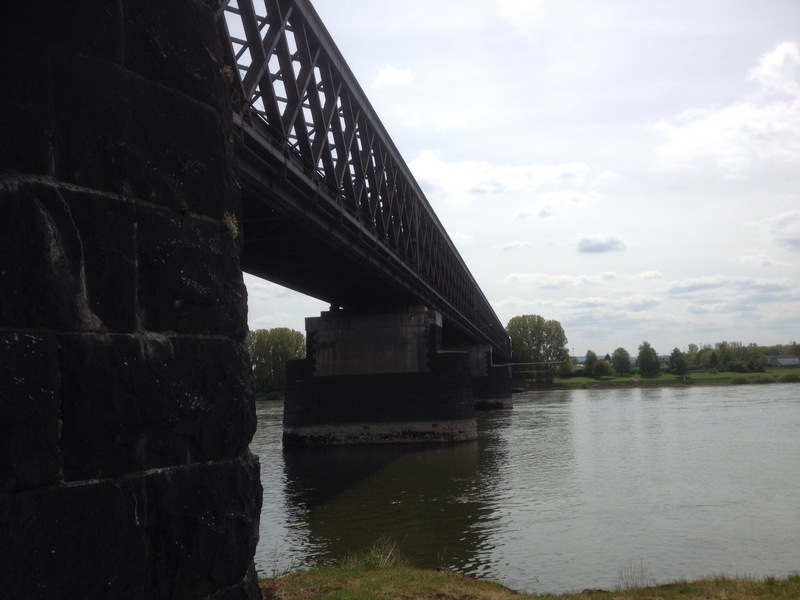 Linz is an attractive town but the railway runs very noisily next to it. 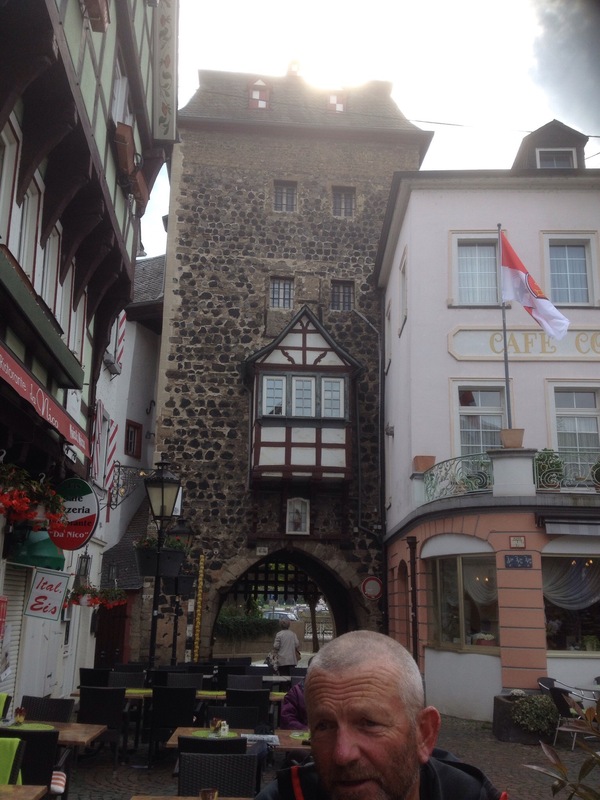 But it had this rather nice portcullis! 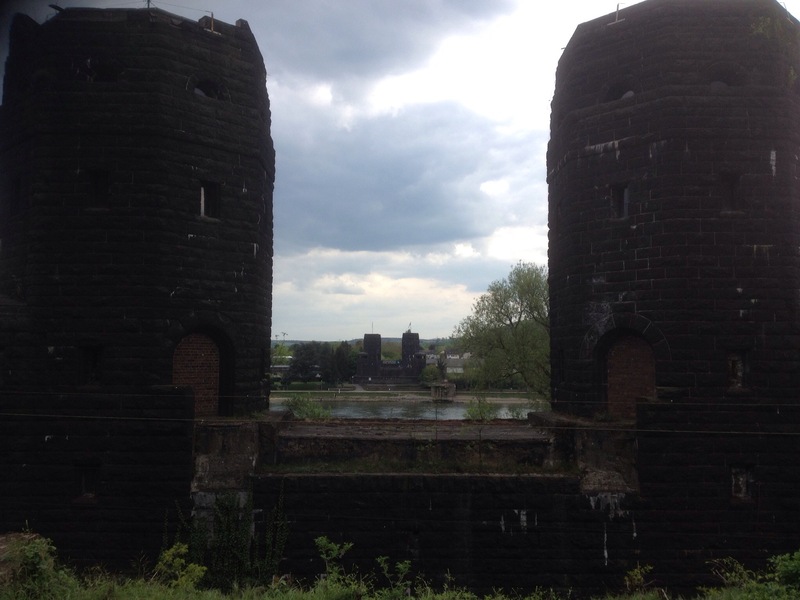 On our trip south we had passed the Remagen bridge – this time we saw it from the other side. 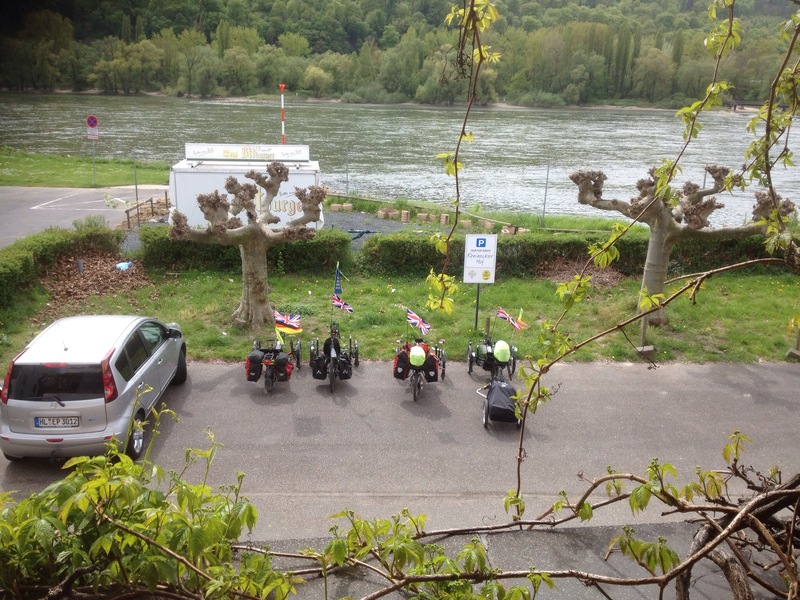 We were all feeling a bit tired now so were glad when Bad Honnef arrived. This was where Joyce and Simon were staying as they had been unable to get space in the same Guesthouse as Klaus and I had booked (they had left their hotel bookings until a couple of months after we had made ours). 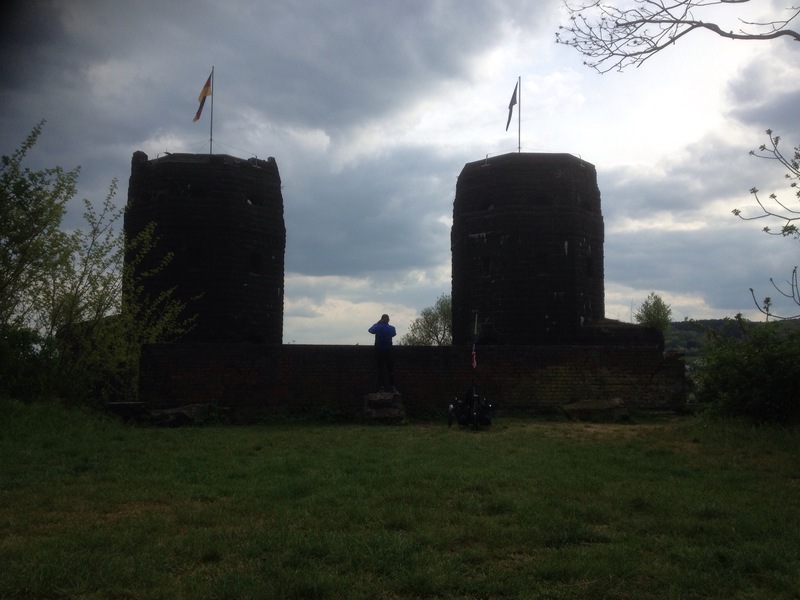 We said goodbye to them and headed off to our hotel which was in Drachenfels, a few kilometres down the road from Bad Honnef, almost in Königswinter. The Guest House was in a Vintner’s and it was a very interesting looking building. 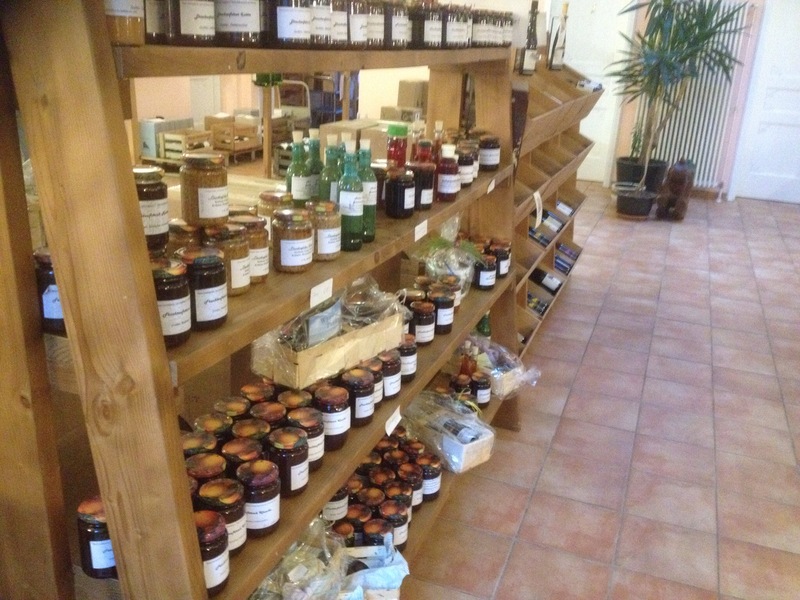 It not only sold wine but also preserves and other goodies. 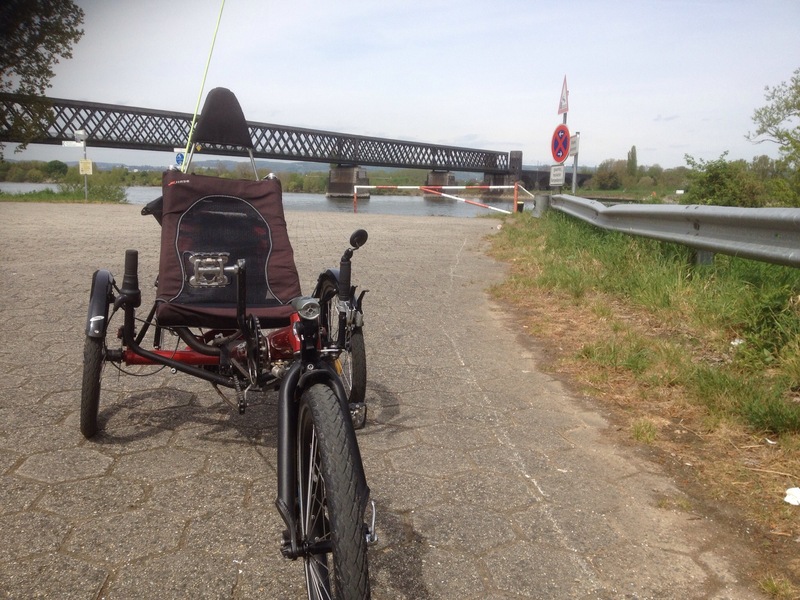 We were greeted by a youngish looking lady – who had a Catrike Speed recumbent trike parked outside! 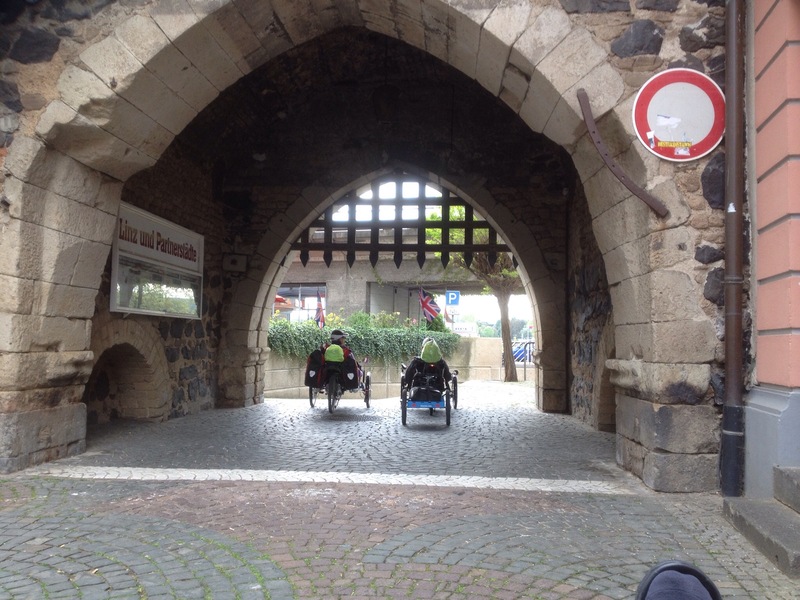 She asked the lady inside whether there was somewhere safe to put our trikes – and there was. The huge, huge room that they use for big events. 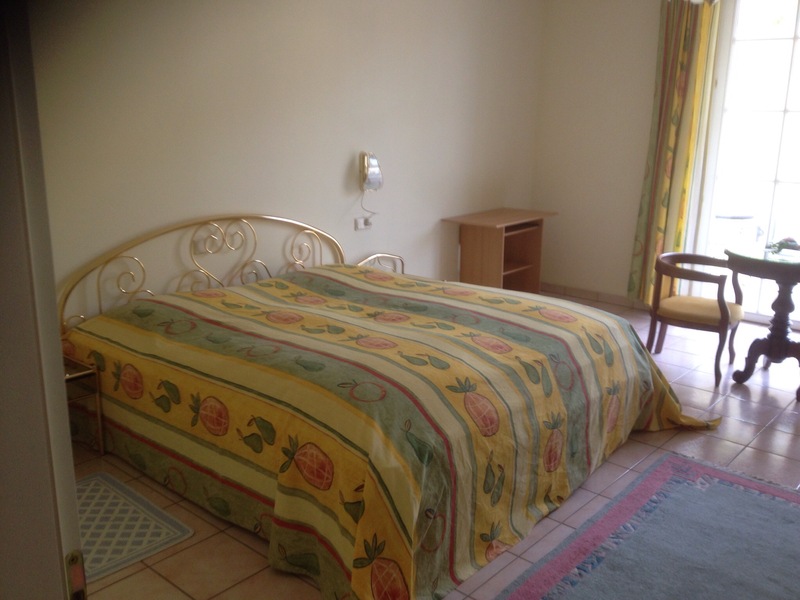 I was very impressed by my bedroom – it had high ceilings, interesting mouldings on the doors and a big couch. As we had arrived the 82-year-old owner had checked where we were going to eat. Apparently the only local eating place closed in two minutes – she said she could phone them to ask them to stay open later but we both wanted a shower before food. There was somewhere we could walk to in a twenty minutes but neither of us fancied that so started making noises about eating the apples I had in my panniers. At which point the lady said she would make us a Flammkuchenm, which we readily accepted (despite Klaus’s no-carb diet). 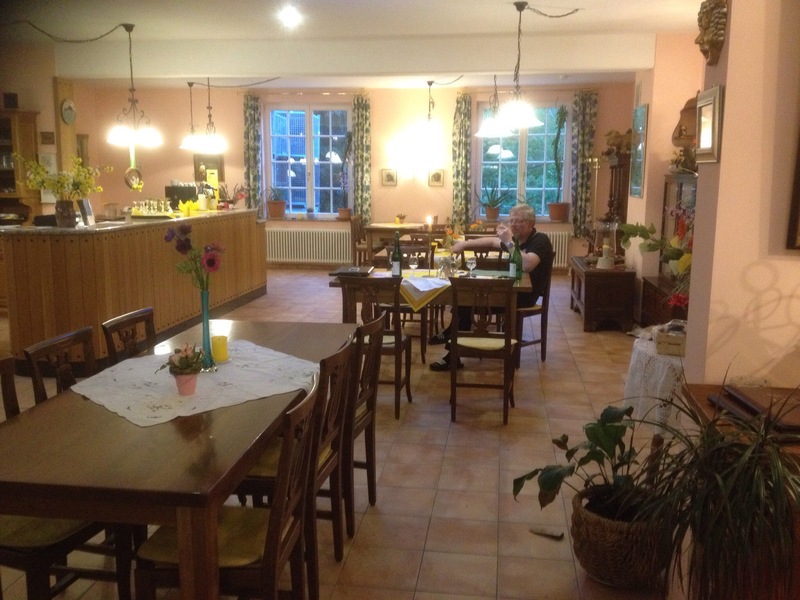 So we arranged to meet downstairs at 7:30pm and I found Klaus ensconced with a litre bottle of wine from this vintner’s. The younger lady with the Catrike was still there and we offered for her to come and sit with us. 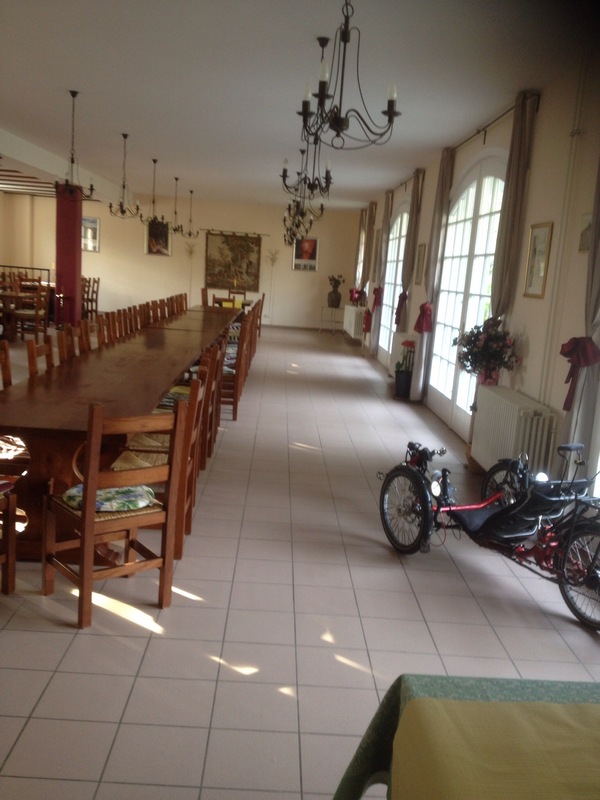 As you can see a table for two in this large room was a bit exposed! 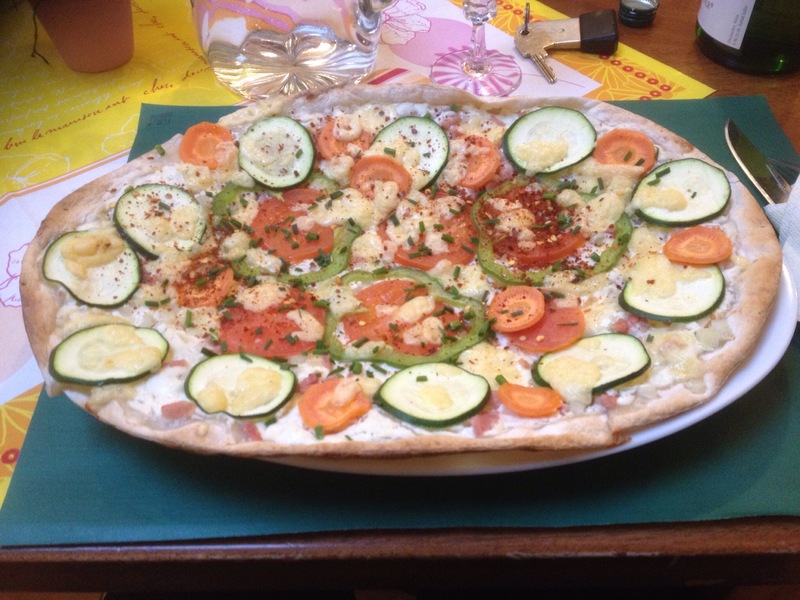 The lady Heike agreed and we had a really great chat as we waited for our Flammkuchen. She was a fascinating woman – she had grown up in East Berlin and had escaped via Prague. She had then been in the German Bundesliga for Handball. She was now an artist. She had some amazing stories to tell and it was really interesting talking to her. Frau Pieper, the old lady, also came to join us so we had a table of four chatting about life, working as a vintner, and more. When Heike found out I played the piano she pleaded with me to play something (there was a piano in the room) so I did a couple of pieces. The piano was appallingly out of tune but the others didn’t seem to notice, fortunately. 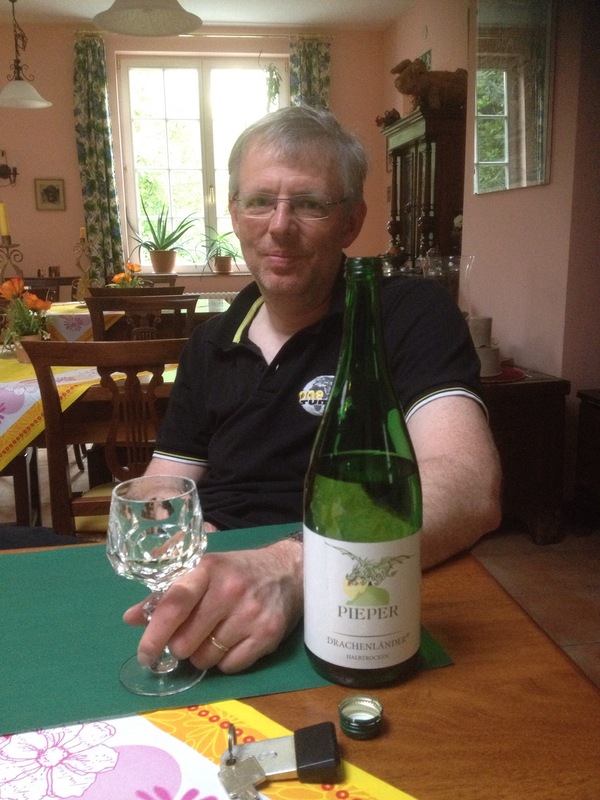 Klaus was steadily drinking his way down the bottle of wine (I was on water of course) and it was a truly bizarre and yet brilliant evening, chatting to two really interesting people. Heike then told us that they had some special cheeses in the kitchen so in due course they came out, with some meat as well. 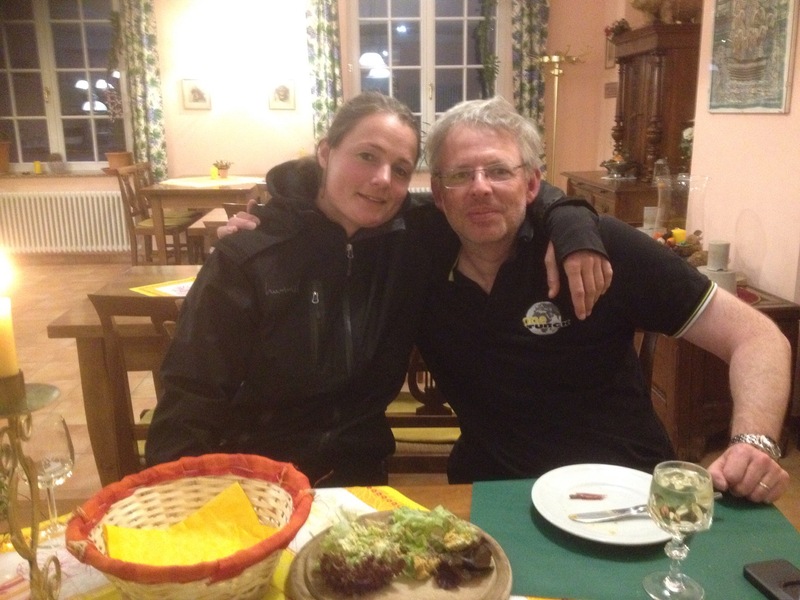 Here are Heike and Klaus after they’ve both enjoyed a fair bit of wine! 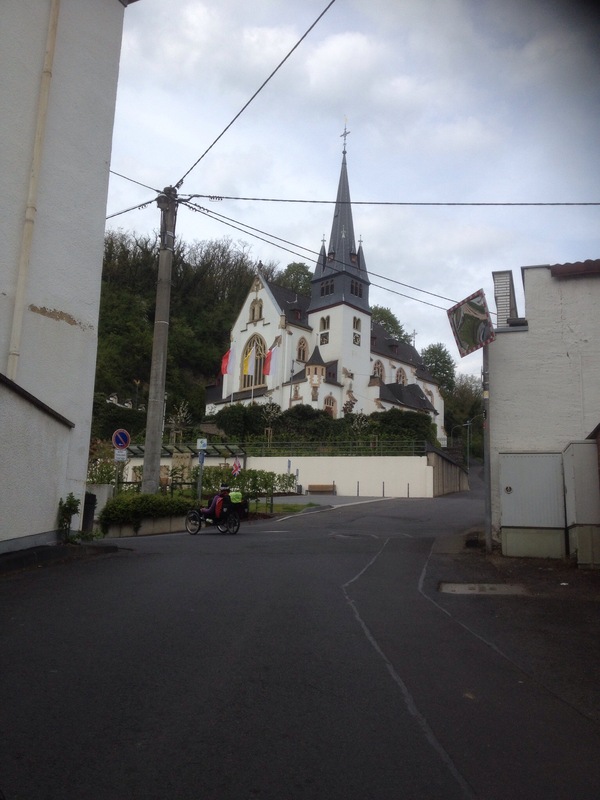 It was after 10pm when Heike headed off back home to Beuel (12km). I had to write up this blog but discovered the internet connection was too slow for the photograph uploads so I had to leave it – this I am writing it a day later. 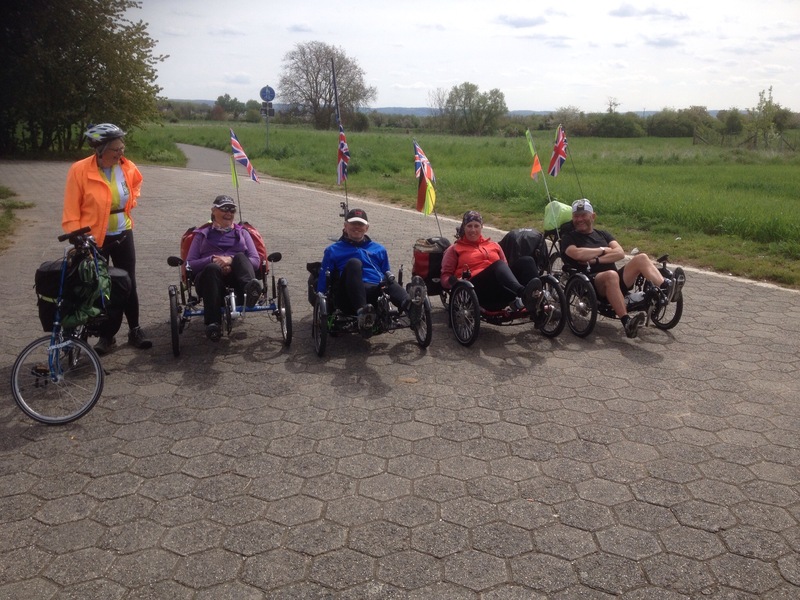 Today was a brilliant day with some great cycling (with a few challenges), some good food and meeting Heike who was such a fascinating lady. 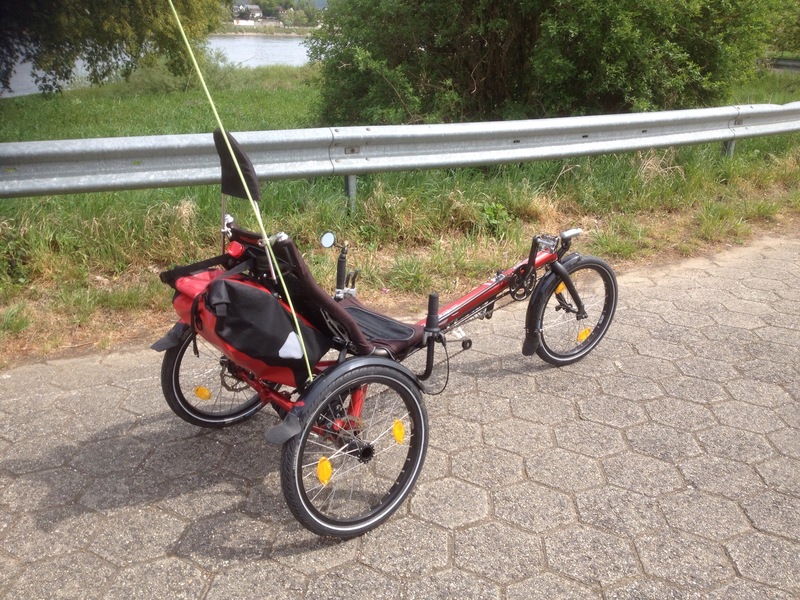 Our cycling distance was 76.1km at an average speed of 14.7km/h.